Omar Amastan Mouffok from Algeria wrote to me describing the flag used by the Palestinian police, which he has seen several times on TV, as being the Palestinian flag with the arms on the red triangle. I sent him the above draft and asked him to report any differences. He believes that the red triangle should be shorter (i.e. like in the standard Palestinian flag) and that the arms do not show the crossed sabres under the eagle. It's interesting that it would seem that the police, chairman, and state flags are basicaly the same with only the symbol moved around the field to differientiate them. On 3 July 2003, the Público newspaper featured a medium-sized article about the control, by the Palestinian security forces of the city of Bethlehem. 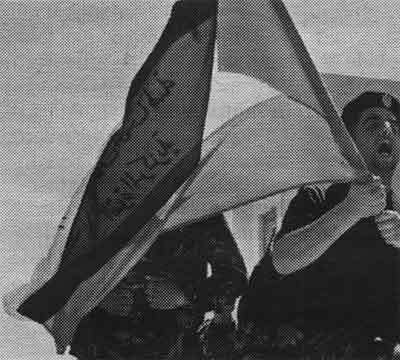 It was illustrated by a photo of a group of security officers parading behind a Palestinian flag with something written in the white stripe [scan], as in other images seen previously. But, unlike the flags in those images, this one features the writing in two rows. Someone with knowledge of Arabic may be able to read it and produce a proper ID of this flag, althout I suspect it to be the flag of the security forces or, at least, of some brigade. The inscription is mirrored and not so easy to read. It seems that the bottom line say "al-quwat al-merkaziya" (The Central Force") and the last word in the upper stripe is "Madaniya" (Civil). If I am correct is could be the flag of the "al-Shurta al-Madaniyya (Civil Police) - al-quwat al-merkaziya" even though the upper line seems longer. BBC World showed yesterday some sort of parade by Palestinian policemen carrying Palestinian flags plus other flags which were greyish (not white, as compared with the white stripe in the nearby Palestinian flags), with a large displayed eagle (or hawk) in black, with two cartouches above and below of the same kind as in the Syrian coat-of-arms (see the 1972-1980 flag), the whole surrounded by a black circle. Any idea what this flag is? Maybe a Colour of the Palestinian Police? 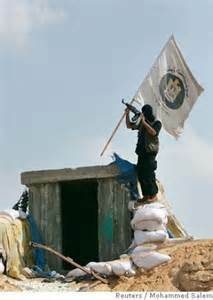 "Palestinian Hamas militant places a Hamas force flag on top of headquarters of security forces loyal to President Mahmoud Abbas after they seized it in Gaza June 13, 2007." At first this struck me as a likely error; the flag is white with the pan-Arab, Nasserist Eagle of Saladin in a black disc – clearly a symbol more appropriate to the nationalist PLO rather than the clericalist Hamas. However today on the news I saw a captain of the Hamas militants being interviewed, and he was wearing a yellow vest with the same badge. Perhaps the photo was mislabeled, and the vest had been looted. Or maybe Hamas uses the Eagle of Saladin now too – but either way, this is an UFE. The upper line of writing might be legible; the text in the image is a placeholder. I think that it is a police or other security force flag and the photo shows it being removed and not hoisted since those units are Hamas' bitter enemies. Hopefully you can identify this flag, supposedly of some unknown Hamas flag, but the "eagle" logo seems to be that of Egypt or Syria. This image is a Reuters photo take on June 13, 2007. See above. 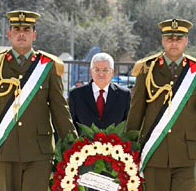 A November 10, 2007 BBC News article contains a photo of a Palestinian-flag sash, worn diagonally by two officers during the ceremonial unveiling of Yasser Arafat's mausoleum in Ramallah. Palestine doesn't have an Air Force – the Palestinian National Authority received, as a loan, two Mil Mi-8's from Egypt for use as VIP transports. Both used Egyptian civil registration, with the Palestinian flag on the fuselage. Those helicopters are now back in Egypt and not in use for this purpose anymore.